A close friend of mine, was forced by her grandparents to choose a wedding date, that was consulted with a feng shui expert to be a lucky date. 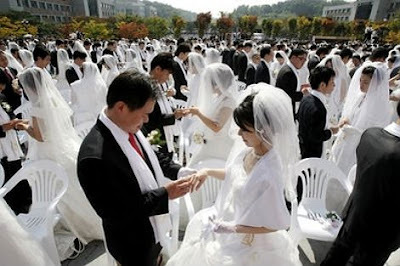 The supposed wedding date was so lucky in fact, that there were hundreds, perhaps even thousands of Chinese weddings scheduled for that day. So for that particular date, they couldn't get ALL their preferred wedding vendors--- from her ultimate dream gown designer, to the videographer, to the caterer, to the Church. Everyone was so booked in fact, that they can't even get their second and third wedding vendor choices. SO booked as well, that they now have to contend, with a venue where there will also be other weddings on the same day, so the place is expected to have thousands of wedding guests from several weddings which may lead to mayhem. How lucky is that, then? Another friend of mine, was told by his father, to have his wedding date AFTER the Chinese New Year, because if he did it BEFORE the Chinese New Year, his wife will dominate their marriage forever. Don't get me wrong, I have nothing against upholding these Chinese beliefs--if you are Chinese, but these friends I am referring to are NOT even Chinese! Here's my own take on the "Lucky" date. To me, a lucky date is a date, where all your dream wedding vendors are available, you are the only one having a wedding on that day, and you can get reasonable deals because it's an off peak date. To me, a lucky date may also be as simple as your anniversary date when you were still bf/gf, or exactly a year after the proposal. Or perhaps, a lucky date that YOU believe it is lucky and not because someone TOLD you it was lucky--as simple as that. A Rebellious Bride chooses her own destiny. And chooses her own wedding date because she and her groom want it so. I just started reading/ browsing your site yesterday and now i'm down to the oldest entries! whew!